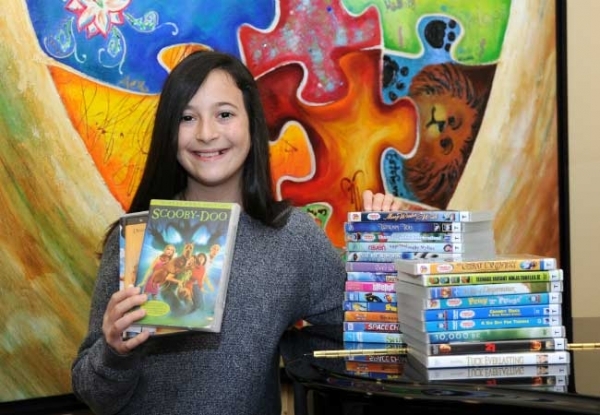 Kayla Abramowitz is the founder of Kayla Cares 4 Kids, a Nonprofit organization that donates entertainment and educational items to children’s hospitals across the country. The idea to provide entertainment relief to hospital-bound kids came to Kayla when she was just 11 years old, after extended hospital stays of her own. Kayla has Crohn’s disease, juvenile arthritis and eosinophilic colitis. Social awareness, though, probably started even earlier than that for Kayla. When Kayla was just a kid, her mom started a family Saturday ritual where Kayla and her brother followed their mom to donate leftover bagels to homeless shelters in their community. In 2015, Kayla presented her organization at the National Young Entrepreneur’s Academy contest and won first place. She has also been recognized for innumerable charitable awards, and has stacked up a few thank-you notes from senators, governors and even President Barack Obama. Despite the demands that come with juggling schoolwork, a Nonprofit, her own hospital visits, and being a good older sister (she helps her brother with homework), she sat down for a chat with us. CC: What inspired you to start Kayla Cares 4 Kids? KA: I just came home from a really long hospital stay. I spent a lot of time at children’s hospitals, and I realized that the hospital was really boring and there wasn’t a lot of stuff to do. I really didn’t like that and I wanted to change it. CC: How did you want to change it? KA: In the very beginning, I had a very small goal, though at the time was very big: 100 DVDs that I would donate to the hospital. My dad thought I was ridiculous. And my mom didn’t say anything. She was quietly supporting it. I took on the initiative of going around the neighborhood with fliers made on PowerPoint. And I ended up getting 300 DVDs so I surpassed my goal. CC: How has your non-profit grown? KA: So I made my first donation to that hospital and then from there I just kept moving to more and more hospitals. Eventually it went national. From that point, I’ve donated more than 12,000 books, DVDs, and anything that can entertain and educate children in all 50 states with 100 medical-sized facilities. CC: How did you collect so many? KA: It all started with me going around my neighborhood and getting those DVDs. And then it expanded to my school. We had a school-wide collection with my Girl Scout troops. And then I started going and talking to businesses, like our local Starbucks because regulars go in there so we put a shoebox lot. And I got a collection box there. I have collection boxes all across my local community now and I have ambassadors all across the country collecting and donating in their local communities. The more people who are supporting you, it just makes more of an impact. CC: What are some obstacles you had to overcome? KA: Our biggest obstacle and we’re kind of running into it now – it’s just areas where we can place the items. For a really long time, we had all the items that we’re getting just stored in our living room and our garage and even in my room and my brother’s room. It was kind of getting to the point of ridiculousness. Then somebody donated this storage facility to us. And it has a limited time on it and the owner has generously renewed it once but we’re still looking for an office space to look professional and really have people there to help us with our organization. CC: Have you received any feedback from kids who have received DVDs donated through Kayla Cares 4 Kids? KA: We’ve hand delivered 25 donations. Some places didn’t even have DVD players. Seeing them get to watch their first DVD at the hospital or seeing them play the Xbox for the first time because their family doesn’t have that at home and they can finally play it. And seeing that smile on their face, it’s just heart warming and it shows just how much my organization really helps these kids. CC: Who are your biggest supporters? KA: My friends are absolutely fantastic helping my organization. They always want to help out and they are so proud to talk about it to other people. CC: A lot of people have great ideas but not everyone does something about it. What made you pursue your idea? KA: I’d always been a shy person before I started my organization. I never really did things. I think just the passion I had in this project of 100 DVDs, I think it really inspired me. CC: You’ve been doing Kayla Cares 4 Kids for 3 years now. That takes persistence and motivation. How do you keep going? KA: With all of my medical issues, it’s kind of hard for me to balance all of my schoolwork, going to the hospital and doing my organization. So I was thinking about giving up. Then I had the chance to sit down and start working on my organization again and I just reached inside to the goal I have inside of me and realized all of the good that I do. I definitely think I found the perseverance through my organization. If I hadn’t done this, I think I would be a very shy, shelled up girl, probably playing video games in my room. CC: Your accolades are numerous. How does it feel to be recognized? KA: In the beginning of my organization, I never even considered getting awards for it. I never even thought it would turn into a Nonprofit. I just wanted to donate videos. The fact that people are recognizing me and showing me they care, it means the world to me. But even if I don’t win awards, just the fact that somebody noticed me enough to get me to that level, I’m just so honored. CC: So what is the goal for Kayla Cares 4 Kids going forward? KA: I have the ultimate goal of donating to all 250 children’s hospitals [in the U.S.] and all 181 Ronald McDonald houses plus whatever other medical facilities that need assistance. KA: I get asked this question a lot, and I never know the answer to it. I think I just want to be something really unique. I don’t know what that entails, but just something fun and unique. For information on how to get involved with Kayla’s Nonprofit organization, visit the Kayla Cares 4 Kids website.